Yes, you heard that right. 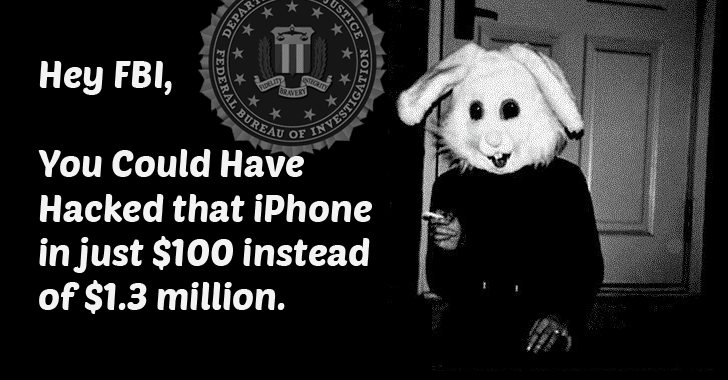 Now anyone can unlock an iPhone for less than $100, for which the FBI paid more than $1 million. Cambridge University security researcher Sergei Skorobogatov has published a new research paper detailing a technique that would have helped the FBI bypass the iOS passcode limit on the shooter’s iPhone 5C. In his research paper published on Thursday, Skorobogatov says that the FBI was just wrong in its assessment of NAND Mirroring, but also spent $1 million of taxpayers’ funds on a case that could have been solved for a few hundred dollars. So far, the FBI and Apple have not commented on Skorobogatov’s research. For more technical details about this technique to bypass iPhone’s passcode security limit, you can head onto his research paper.